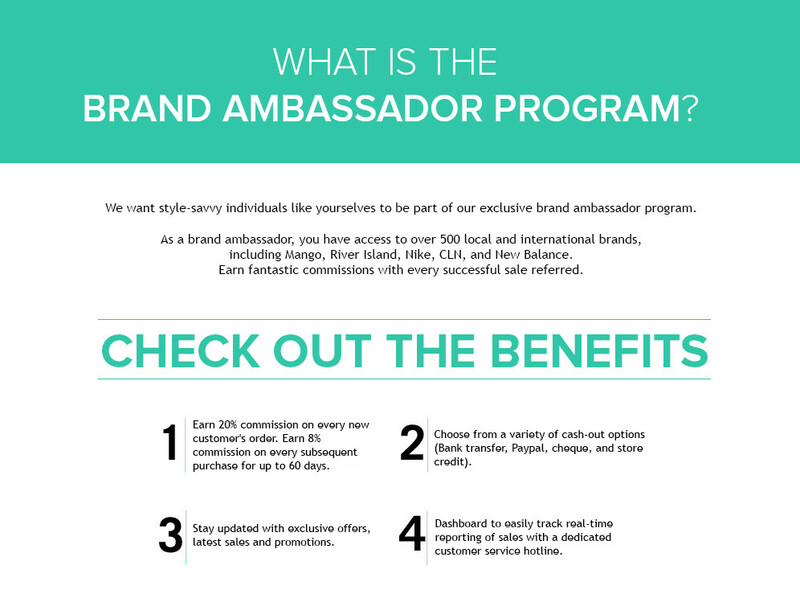 ZALORA Philippines Brand Ambassador Program | Get rewarded now! BF Jade E-Services Phils. Inc., (ZALORA Philippines) maintains this web site ("Web Site") and is responsible for this promotion. You can access and use this Web Site only if you agree to and accept the following terms and conditions applying to your use ("Terms and Conditions") without limitation or reservation. Please read these Terms and Conditions carefully before accessing and browsing this Web Site. You may download material displayed on the Web Site for your non-commercial, personal use only. Additionally, you may not modify, reuse, report, or use the contents of the Web Site for public or commercial purposes, including the text, images, audio, and video without BF Jade E-Services Phils. Inc.’s written permission. BF Jade E-Services Phils., Inc. reserves the right to cancel or amend the promotions mentioned on the Web Site or these Terms and Conditions at any time without prior notice. Any changes will be posted either within the Website or these Terms and Conditions. 20% Commission is valid only on the first order by a New Customer. 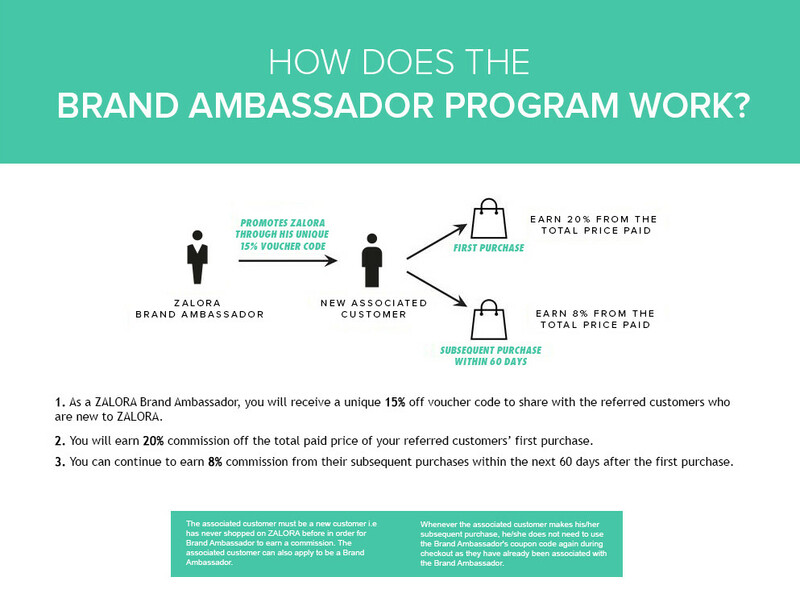 Brand Ambassadors will earn 8% of subsequent orders made by the same customer within the next 60 days. Brand Ambassadors can earn a maximum of P2500 for each successful customer referred. Brand Ambassadors need to accumulate a minimum commission of P500 in their accounts before they can cash out. Successful payouts will be issued upon nearest monthly cutoff date (30th of each month). Commissions will not be paid on the purchase of non-sale items, listed here. Voucher codes are not valid on non-sale items, listed here. Brand Ambassadors cannot bid for ZALORA terms for online paid marketing. Brand Ambassadors cannot post their Voucher Codes on public places except on their personal social media platforms and personal websites. In view of ZALORA’s 30-day return policy, commissions will only be paid 40 days after an order has been successfully delivered. No commissions will be paid if customers cancel/refund orders within 30 days. ZALORA will not be liable for employment liability clauses. ZALORA will retain the right to terminate a Brand Ambassador or withhold payment within reason. 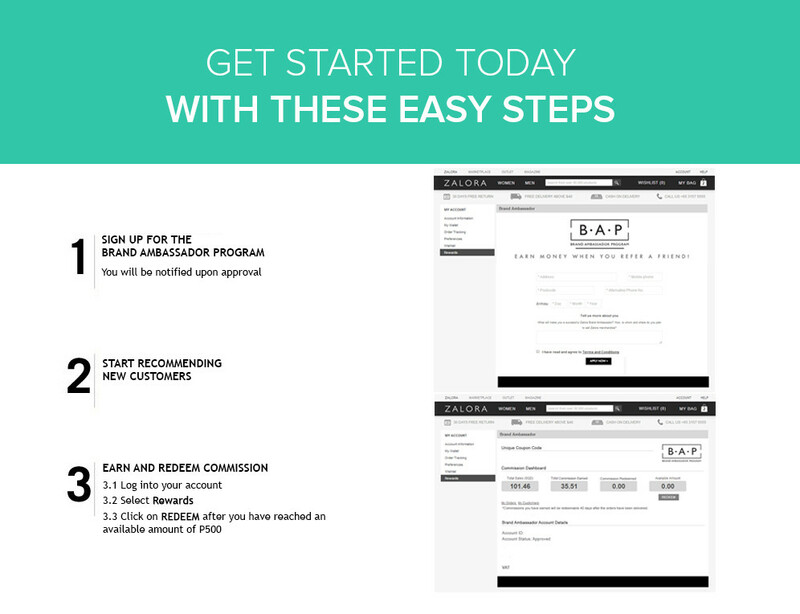 Customers cannot participate in more than one ZALORA referral program at any given time. BF Jade E-Services Phils., Inc. cannot accept any responsibility for any damage, loss, injury or disappointment suffered by any entrant entering the Program or as a result of entering the Program or accepting any prize. BF Jade E-Services Phils., Inc. is not responsible for any safe custody, return, non-delivery or missing of entries, late, misdirected, problems or technical malfunction of any telephone network or lines, computer on-line systems, servers, or providers, computer equipment, software failure of any email or entry to be received on account of technical problems or traffic congestion on the Internet, telephone lines or at any web site, or any combination thereof, including any injury or damage to entrant's or any other person's computer or mobile telephone related to or resulting from participation or downloading any materials in the Program. By entering the Program or accepting the prizes, You agree that no claim relating to such losses or injuries (including special, indirect and consequential losses) shall be asserted against BF Jade E-Services Phils., Inc. its parent companies, affiliates, directors, officers, employees or agents from any and all losses, damages, rights, claims and actions of any kind resulting from the Program and acceptance of any prize, including without limitation, personal injuries, death and property damage. to the use of your answers to the questions and/or tie breaker for BF Jade E-Services Phils., Inc.’s promotional and marketing purposes. BF Jade E-Services Phils., Inc. and its affiliated companies respect the privacy of every individual who visits our Web site or responds to our advertisements and Programs.